Woodland is a city of 5,700 in Cowlitz and Clark Counties, though most residents live in Cowlitz County. It is located in southwestern Washington between the larger cities of Longview and Vancouver and between the Columbia and Lewis Rivers. Neighboring cities are Kalama, La Center, and Ridgefield; the Vancouver-Portland, Oregon, metro area is about 25 miles to the south. 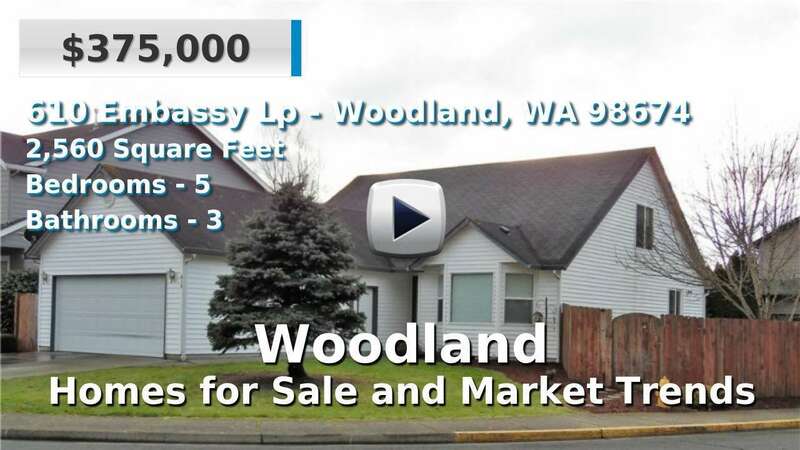 Homes for sale in Woodland are much newer than state and county averages and the city is growing steadily with a large market of new construction. It is known for the Hulda Klager Lilac Gardens and annual Lilac Festival which draw visitors from all over the world, as well as the Planter's Days festival, one of the Pacific Northwest's oldest such celebrations. 3 Beds | 1512 sq. Ft.
3 Beds | 3 Baths | 2906 sq. Ft.
3 Beds | 2.5 Baths | 2484 sq. Ft.
2 Beds | 2.75 Baths | 1896 sq. Ft.
3 Beds | 3.5 Baths | 3505 sq. Ft.
5 Beds | 3 Baths | 5400 sq. Ft.
3 Beds | 3 Baths | 1780 sq. Ft.
3 Beds | 2 Baths | 1814 sq. Ft.
4 Beds | 1825 sq. Ft.